The chances are that if you’ve chosen vinyl flooring you’ve gone for the superb look of rich wood, natural stone or a stunning mosaic design. We know you’d like to keep it stunning too so here’s our hints and tips for looking after your vinyl. As soon as your floor is installed you need to treat it with respect. That means for the first 24 hours avoid walking on any seams or edges and try to keep off it as much as possible. Vinyl is hardwearing but you should really avoid sharp objects being in contact with your floor. That means keeping high heels in a good state of repair and even avoid using them altogether on vinyl. Also, on the note of avoiding sharp objects, sweeping regularly not only keeps your vinyl clean but also reduces the chance of grit or hard dirt scratching or cutting into the surface. Your vinyl floor will discolor or fade in strong light. To avoid this use nets, blinds or shade large sun-facing windows during peak sunlight hours. Some kitchen appliances send direct heat to your floor, which may eventually scorch, discolor, burn or fade your flooring. Hot objects such as matches, cigarettes, pots and oil may also damage your floor. To prevent damage place non rubber-backed mats at key areas, such as your oven. Felt floor protectors can do so much to keep your vinyl in great condition. Put them on the legs of your furniture, allowing to be moved easily without scratching or denting your floor. Protectors can also provide a sound deadening barrier. It’s a good idea to replace your felt pads regularly as they become worn over time and also dirt and grit can become embedded in them. Good quality, dirt trapping walk off mats at key exit and entrance areas prevent dirt and sand from entering your home. Rugs are a great idea for use on high traffic areas. All rugs should allow your floor to breathe. 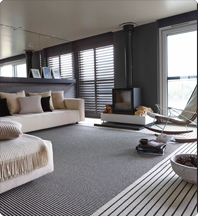 Use no-slip rug underlayment made especially for hard surface flooring to prevent accidents caused by moving rugs. Like every type of flooring, your vinyl will need cleaning from time to time. At Carpetright, we’d always advise you to use the manufacturer’s recommended cleaner when known. You should always wipe up food or other spills straight away using the recommended cleaner and a soft cloth. Dry spills and abrasives can be dealt with by using a vacuum or soft broom, but if you do use your vacuum cleaner, turn off the beater bar if you can and use the hose with an upholstery attachment. Vacuum wheels may also be a source for indenting and scuffing, so check your wheels for imbedded grit. You can also clean most modern vinyl floors with warm water. Ordinary detergent on your vinyl floor can leave a sticky residue and doesn’t always rinse clean so we don’t recommend their use, however here’s a great little tip: you’ll find most manufacturer’s vinyl cleaners are concentrated, so you can mix a batch using the proper dilution ratio and keep it handy in a spray bottle. Your pre-mixed bottle of cleaner can then be used to wipe up spills, quickly and conveniently. Copyright © by Carpetright 2016. All rights reserved.